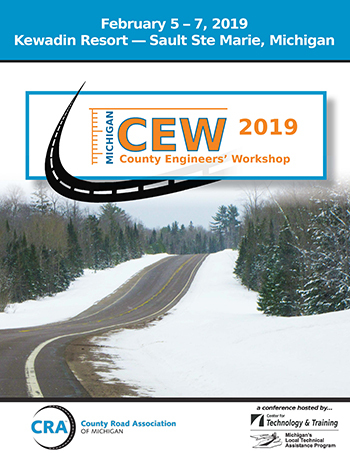 The Michigan County Engineers' Workshop (CEW) is a workshop open to engineers, engineering consultants, public agencies, and County Road Association of Michigan associate members. At CEW, industry experts and peers present innovative ways to build, manage, and maintain roads and bridges. CEW provides an opportunity to learn about the latest research and legislation affecting the construction and maintenance of county roads and city streets. Participants will also learn about equipment, products, and services that are relevant to the needs of county and city road agencies. CEW is a conference of the County Road Association of Michigan. It is hosted each year by the Center for Technology & Training (CTT), home of Michigan's Local Technical Assistance Program. For more information on the program and for registration information, please explore the tabs, above, on ctt.mtu.edu/cew. Join us February 4-6, 2020, in Manistee for the 2020 County Engineers' Workshop! Registration for the 2020 CEW will open in November/December 2019. Additional conference details and the agenda will be available in the conference flyer (to be released at that time). Questions? E-mail ctt@mtu.edu or call (906) 487-2012. The Michigan County Engineers' Workshop counts for instructional hours for continuing education for professional engineers. The number of hours will be noted in the conference flyer. The CTT's continuing education policy is available at ctt.mtu.edu/continuingeducation. The links below contain the conference brochure and presenter slideshows for previous years of the County Engineers' Workshop. For events that took place before 2012, you'll be redirected to the Michigan LTAP website.